Yes, this appears to the be the week of Color My Quilt. 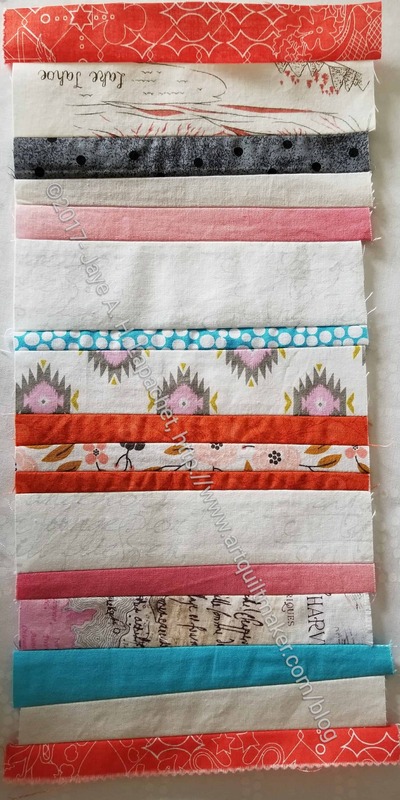 I decided that I would start work on Amy’s Color My Quilt piece right away. 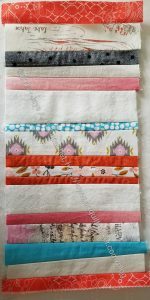 I used it as leaders and enders while I sewed fabric pieces that didn’t require a 1/4″ foot. It was a good plan as I have made enough progress to hand it in today even if I do nothing else. Don’t get the idea that I was doing a shoddy job. I was eyeballing a seam allowance rather than using the 1/4″ foot guide so I could make progress, but not being shoddy. If anything most of the seam allowances are larger than 1/4″. Of course, I want to do more. I think it needs more blue. If I don’t do anymore, I’ll be happy and not embarrassed to give what I have to Amy.